NEW YORK -- Author-columnist Jimmy Breslin, the Pulitzer Prize-winning chronicler of wise guys and underdogs who became the brash embodiment of the old-time, street smart New Yorker, dies Sunday. He was 88. Breslin was a fixture for decades in New York journalism, notably with the New York Daily News. It was Breslin, a rumpled bed of a reporter, who mounted a quixotic political campaign for citywide office in the '60s; who became the Son of Sam's regular correspondent in the '70s; who exposed the city's worst corruption scandal in decades in the '80s; who was pulled from a car and stripped to his underwear by Brooklyn rioters in the '90s. With his uncombed mop of hair and sneering Queens accent, Breslin was like a character right out of his own work, and didn't mind telling you. "I'm the best person ever to have a column in this business," he once boasted. "There's never been anybody in my league." With typical disregard for authority, Breslin once took out a newspaper ad to "fire" the ABC television network when it aired his short-lived TV show in a lousy time slot. That same year, he captured the 1986 Pulitzer for commentary and the George Polk Award for metropolitan reporting. More than 20 years earlier, with Gay Talese and Tom Wolfe, Breslin had helped create "New Journalism" - a more literary approach to news reporting. He was an acclaimed author, too, moving easily between genres. "The Gang that Couldn't Shoot Straight" was his comic chronicle of the Brooklyn mob, "Damon Runyon: A Life" was an account of his spiritual predecessor, "I Want to Thank My Brain for Remembering Me" was a memoir. Breslin was to Queens Boulevard what Runyon was to Broadway - columnist, confessor and town crier, from the Pastrami King to Red McGuire's saloon. He reveled in the borough, even as he moved far beyond it. "Breslin is an intellectual disguised as a barroom primitive," wrote Jack Newfield and Wayne Barrett in their book "City for Sale." The eccentric, entertaining Breslin acknowledged he was prone to fits of pique and a bad temper. After spewing ethnic slurs at a Korean-American co-worker in 1990, Breslin apologized by writing, "I am no good and once again I can prove it." But the Pulitzer committee, in citing Breslin's commentary, noted that his columns "consistently championed ordinary citizens." The winning pieces exposed police torture in a Queens precinct, and took a sympathetic look at the life of an AIDS patient. A few days after the 2001 World Trade Center attacks, he wrote of the dwindling hopes for the families. "The streets have been covered with pictures and posters of missing people," he wrote. "The messages on the posters begging for help. Their wife could be in a coma in a hospital. The husband could be wandering the street. Please look. My sister could have stumbled out of the wreckage and taken to a hospital that doesn't know her. Help. Call if you see her. But now it is the ninth day and the beautiful sad hope of the families seems more like denial." In other columns, Breslin presented an array of recurring characters - Klein the Lawyer, Shelly the Bail Bondsman, Un Occhio the mob boss. They seemed to blur the line between fact and fiction, until the first pair became key figures in Breslin's 1986 exclusive on the multimillion-dollar Parking Violations Bureau scandal. "Of course I would betray a friend for the biggest story of the year," he said after doing just that on the last manual typewriter in the News' old 42nd Street newsroom. After such successes, he held court in Costello's bar in midtown Manhattan - at least until he quit drinking in his post-Pulitzer years. "Whiskey betrays you when you need it most," he said in a 1989 interview. "You think it will fortify you. But it weakens you." Breslin was born in Queens, the son of James Breslin Sr. and his wife Frances. The hard-drinking elder Breslin abandoned the family when Jimmy was 6; he died broken and broke in a Miami nursing home. Breslin's mother supported the family by working for 30 years as a welfare system administrator. Breslin demonstrated few early skills as a wordsmith; he once said that he graduated high school "in the requisite five years" before a brief, undistinguished stay at Long Island University. The college dropout-to-be was already working at the Long Island Press when he enrolled at LIU in 1948. Breslin was a sportswriter, bouncing between papers until landing at the New York Herald Tribune. He became a news columnist in 1963, and quickly found a story when none seemed left to tell. As reporters worldwide arrived to cover President Kennedy's funeral, Breslin alone sought out the presidential grave-digger, Clifton Pollard, and began his report with Pollard having a breakfast of bacon and eggs at his apartment on the Sunday following JFK's assassination. "Pollard was in the middle of eating them when he received the phone call he had been expecting. It was from Mazo Kawalchik, who is the foreman of the gravediggers at Arlington National Cemetery, which is where Pollard works for a living," Breslin wrote. "'Polly, could you please be here by eleven o'clock this morning?' Kawalchik asked. 'I guess you know what it's for.' Pollard did. He hung up the phone, finished breakfast, and left his apartment so he could spend Sunday digging a grave for John Fitzgerald Kennedy." Breslin later covered Robert Kennedy's assassination, in 1968, from a much closer angle; Breslin was standing 5 feet away when Sirhan Sirhan struck at the Ambassador Hotel in Los Angeles. In 1969, Breslin joined author Norman Mailer on a twisted political ticket: Mailer for mayor, Breslin for city council president. After their predictable loss, Breslin observed, "I'm mortified to have taken part in a process that has closed the bar for the better part of the day." By then, the failed politician was a successful author. His second book, "Can't Anybody Here Play This Game? ", was praised for its tales of the sad-sack New York Mets. "The Gang That Couldn't Shoot Straight" was made into a 1971 movie. Breslin dabbled in television and magazine writing, but returned to the newspaper business in 1976 as a Daily News columnist and became part of one of the city's most horrifying stories; the "Son of Sam" killings in 1977. David "Son of Sam" Berkowitz sent Breslin several letters and impressed the columnist enough for him to observe: "He's the only killer I ever knew who knew how to use a semicolon." 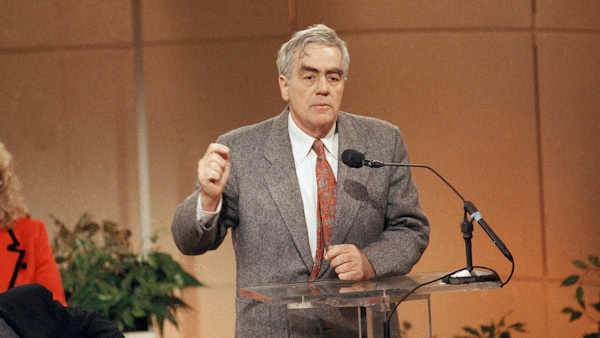 Breslin jumped to New York Newsday in 1988, signing a contract for more than $500,000 a year. During the Crown Heights riots in 1991, the then-61-year-old columnist commandeered a cab and ordered the driver to head directly into the action. About 50 rioters instead yanked Breslin from the taxi, robbed and beat him. Breslin was left with only his underwear and his press card. Three years later, he underwent successful surgery for a brain aneurysm - an episode that led to his memoir. While Breslin had crowds of admirers, he created an equal number of enemies. One of his most enduring feuds was with ex-Mayor Edward I. Koch, who once promised to "give the eulogy at Jimmy Breslin's funeral," a vow undone when Koch died in early 2013. Breslin also made his own ill-fated prediction. In his last regular column for Newsday, on Election Day of 2004, he rejoiced in the expected win of Democrat John Kerry for president; Republican George W. Bush was instead re-elected. Breslin had two daughters and four sons with his first wife, Rosemary, who died of cancer in 1981. He later married Ronnie Eldridge, a former New York City councilwoman. His elder daughter, Rosemary Breslin, died in 2004 at age 47 from a rare blood disease. His other daughter, Kelly Breslin, collapsed at a New York restaurant in April 2009 and died a few days later. She was 44. Eldridge said an arrhythmia episode was considered a likely cause.